Shared memories of places form the threads that people everywhere use to weave their lives and histories together. It is in the very act of remembering that we conceptualise and create our many layered and diverse cultural landscapes. One of the fundamental devices of memory is performance, especially in cultural contexts where knowledge is not transmitted via a written record. Aboriginal Australians possess deep knowledge traditions and philosophical understandings of how people remember landscapes through expressive cultural practices. Through song and dance, and other performative means, people share memories and pass knowledge on to younger generations. The work of creating and maintaining landscapes of memory requires regular fertilisation with narrative performances of ancestral activities and movements. Opportunities for memory work are increasingly facilitated in the contemporary context by the organisation of cultural festivals and the establishment of cultural centres. In these venues, Aboriginal people continue to employ performance to imbue land with the memory of ancestral vitality. Two examples are presented here: the Tjapukai Aboriginal Cultural Centre, which is intimately tied to the small township of Kuranda, also known as ‘the village in the rainforest’, and the Laura Aboriginal Dance and Cultural Festival in Cape York. The success of the show led to the troupe being invited to Brisbane to perform at the World Exposition in 1988 and in 1989 Tjapukai won the first of many cultural tourism awards, the Pacific Asia Travel Association’s Gold Award for ‘cultural development’. This led to an invitation to do a whirlwind world tour to promote the Australian tourist industry. The show was performed 58 times in 60 days across four continents. The Tjapukai Dance Theatre not only provided a vital boost to the tourist industry, it also gave birth to a new sense of pride among Aboriginal people, young and old, who now felt able to take on a renewed responsibility for nurturing the ancestral vitality of their land. Through their bodily movements, Tjapukai dancers replay the engagement of ancestral being with one another in the Dreaming. I refer here to ‘body memory’ and how people remember in and through bodily movement. By ‘dancing up’ the ancestors, the dancers assert their own embodied connection to country. In 1996, the Tjapukai Dance Theatre closed its doors in Kuranda and reopened as the Tjapukai Aboriginal Cultural Park in Cairns. The closure of the theatre in Kuranda created a deep sense of loss. 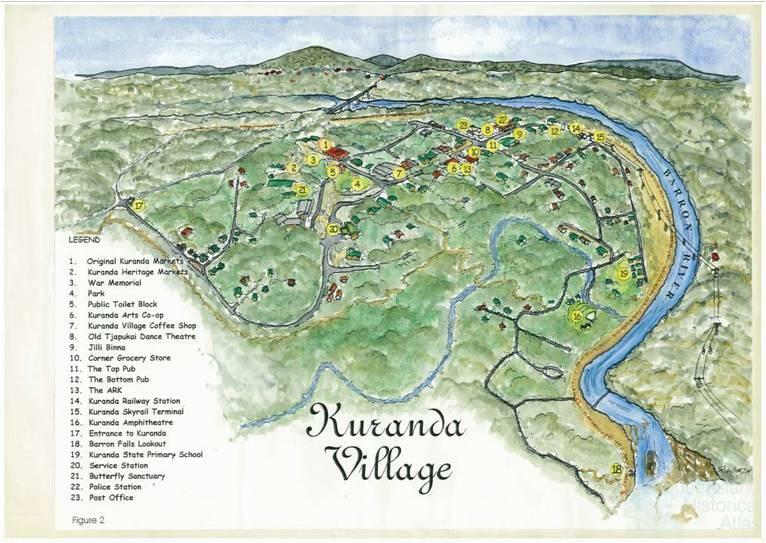 As one Djabuganydji man put it, ‘I feel the heart has been torn out of Kuranda’. 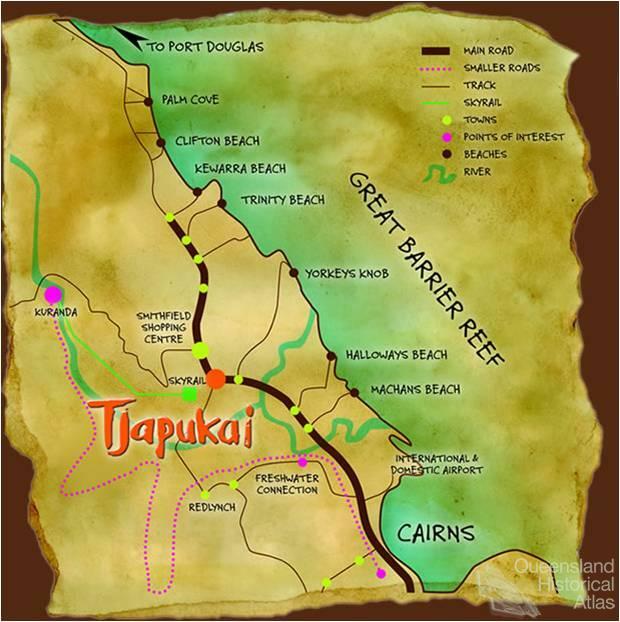 The Tjapukai Aboriginal Cultural Park was born during a period of political unrest in Kuranda over the construction of the Kuranda Skyrail. Djabugay people joined forces with environmentalists over the issue of damage to rainforest and the granting of leases by the government in the National Park. A native title application over the park was lodged and Aboriginal people joined protest marches and a blockade in direct action against Skyrail. Nevertheless, since their priorities also included jobs and a secure economic future for themselves and their children, Djabugay speaking people from the Kuranda area and also from the coastal area, to which the Tjapukai theatre was relocated - Djabuganydji and Yirrkanydji – came to an agreement with the owners of the Tjapukai Aboriginal Cultural Park. They were gifted some shares in the Cultural Park and the opportunity to purchase further shares in the future. In addition, long-term staff members of the Tjapukai Dance Theatre, including dancers and others, were offered a small separate shareholding. 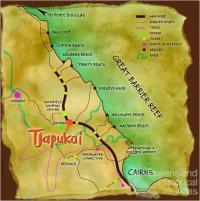 The plan of the Tjapukai Cultural Park maps out performances spaces in terms of an Aboriginal past, present and future. In the foyer of the building is a museum display of objects used traditionally by rainforest Aboriginal peoples of North Queensland. On either side of this space, which is called ‘the magic space’, are two theatres, the Creation Theatre and the History theatre. The Creation theatre features a Djabugay creation story supported by laser display of the totemic world born out of a cassowary egg and holographic images of the ancestor figures. The History Theatre screens a film including photographs and film clips of life on Mona Mona Mission and re-enacted scenes by Kuranda Aboriginal people of first contact, resistance and violent confrontation with the white settlers. On the other side of a lake across a bridge, behind the building housing the History and Creation Theatres, is the open air Dance Theatre. While the History Theatre and the museum present Djabugay identity in terms of historical evidence of past cultural practices and of colonial oppression, the Creation Theatre and the Dance Theatre celebrate a collective memory of embodied relationship to ancestors and to country. At the Tjapukai Cultural Park the dancers announce to the audience that dances ‘passed on from our ancestors and dances created in their memory’ are performed. The performances are not just for tourists but are creative commemorative ceremonies, which bring the past into the present to be borne forward towards the future. The Laura Aboriginal Dance and Cultural Festival brings together many culturally distinctive peoples from all over Cape York Peninsula. Its roots go back to 1972, when a regional festival was hosted by Aboriginal people from Lockhart River, Cape York. The organisation of the first Cape York Festival, at Lockhart River, necessitated some rapid adjustments in performance practices by the participants. The festival, as a newly forged intercultural space, brought together distant groups to perform in the presence of one another for the first time, and this led to some concern about the correct ritual protocols that should be followed. Because these early festivals were envisioned as a means of ‘cultural revival’ of ‘traditional’ song and dance, they generated lively competition between groups about how close the performances were to the memory of past practices that had been almost lost as a result of the conditions of life imposed by missions and reserves. The success of the Lockhart River Festival led to the idea of an annual Cape York Festival, hosted by a different community each year. The festival was held in Mossman, Hopevale, Wujal-Wujal and Cooktown, before it was decided to make the tiny town of Laura, 300 km northwest of Cairns, the permanent site of the festival. 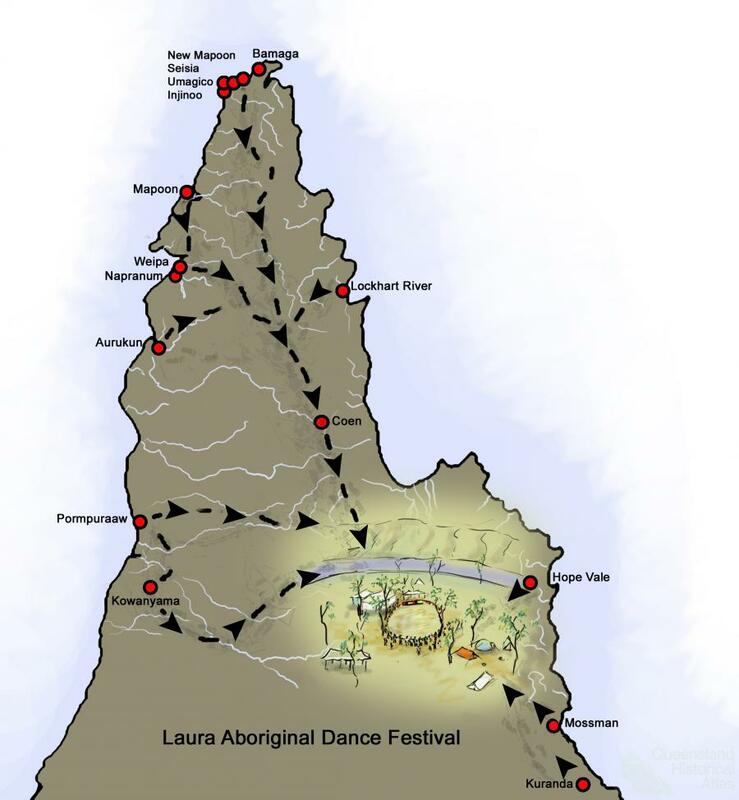 Thus, since the early 1980s the festival has been hosted, with the support of the Ang Gnarra Aboriginal Corporation, beside the Laura River, in strikingly beautiful Quinkan country, famous for its Aboriginal rock art. The galleries are on the Australian Heritage Estate and are listed by UNESCO as being among the top ten rock art sites in the world. The Quinkan reserve, including the Laura Festival ground, was handed back under the Aboriginal Land Act 1992 (Qld) to the Western Kuku Yalanji people in a special ceremony at the 1997 Festival. Situated in a warm sandstone landscape, the festival ground is fringed by dramatic rocky escarpments that during the festival echo not only with the sounds of clap-sticks and didgeridoos but also contemporary Aboriginal rock, reggae and country bands. The Laura festival brings Indigenous and non-Indigenous participants together into an Indigenous landscape. The remoteness of the festival ground, out in ‘the bush’, means that the participants are captured in that space for the time of the festival. Visitors are provided with mud maps of the festival ground and are allowed to pitch their camps on site in specially designated camping spots, away from the camps of the different Indigenous dance groups. Areas are set aside for food and market stalls, government and non-government agencies, sporting activities, cultural workshops and so on. Yet, in spite of this social mapping of the festival ground, the festival also works to erase distinctions among festival participants and foster intercultural relations. While allowing Cape York peoples to celebrate social and cultural differences expressed in dance, the festival has also helped to forge connections that have contributed to the development of a strong regional Cape York identity. Until 1993, the Festival had been a relatively small regional festival organised specifically to cater for Aboriginal community participation, not the tourist industry. However, in recognition of the International Year of Indigenous People, the 1993 festival hosted Indigenous dancers from the Solomon Islands, Africa, Canada, and the USA, attracting many international visitors. Attendance at the festival doubled to over 5000 people in 1993 and since then each festival has continued to attract large numbers of domestic and international tourists. Over 6000 people attending the 1997 festival bore witness to an emotional ceremony marking the official return of the land on which the rock art galleries and the festival ground are located, to the traditional owners. Each festival is given a particular theme and takes on a flavour of its own, depending on current issues of concern. For example, the theme of the 1999 festival was Care and Respect for Elders. The 2001 festival theme was Reconciliation and a special reconciliation ‘night walk’ was held. At the 2005 festival, Cape York communities mourned the loss of lives of family and friends in an air crash on the 7 May 2005. The plane had crashed into a tree covered hillside on approach to Lockhart River airstrip on a flight from Bamaga at the tip of Cape York. In 2007, the Laura Festival marked its 30th anniversary with the theme of Respect and Recognition of Culture, Country and People. Dance is the main focus of the three day Laura festival and different dance teams are scheduled to perform one after another, all day long. The performances are not just for visitors but also an exchange among Indigenous groups. 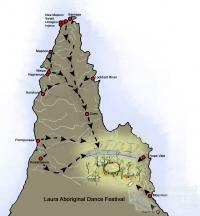 The dance performances evidence a dynamic continuity of social relations among different Cape York groups. Although there is an emphasis on the cultural continuity of the performances, culture is not represented as something static or fixed in time past. Rather, culture is performed as a dynamic process. Elders can be observed instructing the junior dancers on the dance ground during their actual performances. The significant point here is that performances are not necessarily presented as finished products. The performances are as much exhibitions of a process of teaching and learning as they are displays of given song and dance routines. Festivals are an opportunity to evidence cultural vitality, by publicly performing a process of transmission and acquisition of embodied knowledge. At the Laura festival in 1995 there were 170 child performers of a total of 478 dancers, while in 1997 there were 202 of a total of 467. Aboriginal people flock to the festival from all parts of Cape York and from communities further south not only for the sake of engaging and sharing in dance and other expressive cultural activities, but also to make contact with family members. The festival provides a means for descendants of Aboriginal people who were removed from the area to find long lost relatives, to learn about their ancestry and to share memories of family history. Such exchanges also constitute practices of memory. Just like the dance performances on the festival ground, the narratives and stories shared around the camp fires at night contribute to the performative creation of landscapes of memory.